Click here to get great modernist content via email This basic sous vide setup has everything you need to create great sous vide results at home. It's by far the most cost efficient method for the home cook and requires very little effort to set up and use. While this method can cost several hundred dollars to set up many cooks already have some of the equipment, such as a crock pot. Most of the equipment in this setup can also be reused for many non-sous vide purposes so they are not just a single-technique item. If you are looking for an inexpensive but very good sous vide setup then this is the one for you. I highly recommend getting a home vacuum sealer, preferably FoodSaver. They can be found for $125+ and they make sous vide cooking much easier. 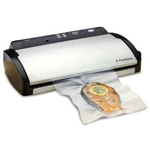 While they fall short of the power and features of a chambered vacuum sealer they are about a thousand dollars less expensive and bring enough features to make it worth while. There are also more reasons to get a vacuum sealer. That said, ziplock bags work just fine for most sous vide dishes. For this basic sous vide setup the best water bath is a self-heating device. Rice cookers are the best but crock pots also work very well. As long as the chamber is big enough for the size of food you will normally be cooking them you should be fine. I recommend starting with whichever device you already own, but if you don't have a rice cooker or a crock-pot I would go with a new rice cooker because it has better distribution of heat. Also, if you do not currently own a crock pot or rice cooker you can look at the Sous Vide Supreme, it will cost about the same if you need to purchase the crock pot and the following controller as well. In my opinion, the most cost-effective way to control sous vide temperature is with a sous vide controller. There are many different brands but SousVideMagic has a good reputation and focuses almost exclusively on sous vide cooking, it is also what I personally use at home. The sous vide controller works by measuring the temperature of your water bath and turning your heating device (the crock pot or rice cooker) on and off to maintain a consistent temperature. I've had great results with this even for short ribs that were cooked for 48 hours. With this sous vide setup there are only two "hands-on" cooking moments required. The first is to pre-heat the water bath, this will help to keep a steady temperature in the water bath due to the way the sous vide controller works. The second is for long-cooking dishes to occasionally rotate the food in the water bath, I do this about every 5-10 hours if I'm around. That is all the effort you'll have to expend to have almost top grade sous vide food. Total Cost:$450 for a complete sous vide set up, assuming you don't have any of the equipment already.